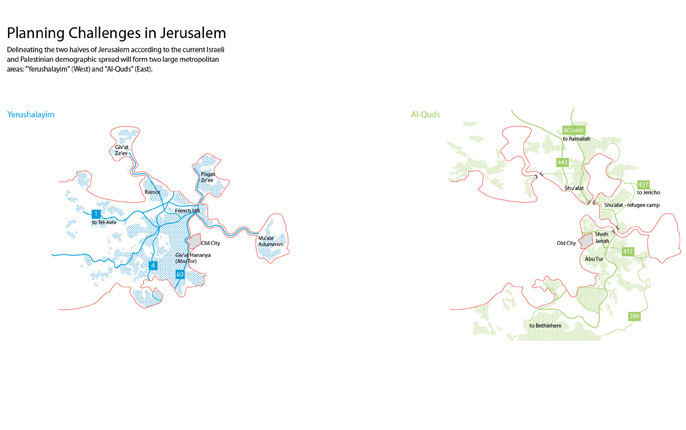 The “Geneva Accord” is an extra-governmental peace-proposal aiming to resolve the Israeli-Palestinian conflict. 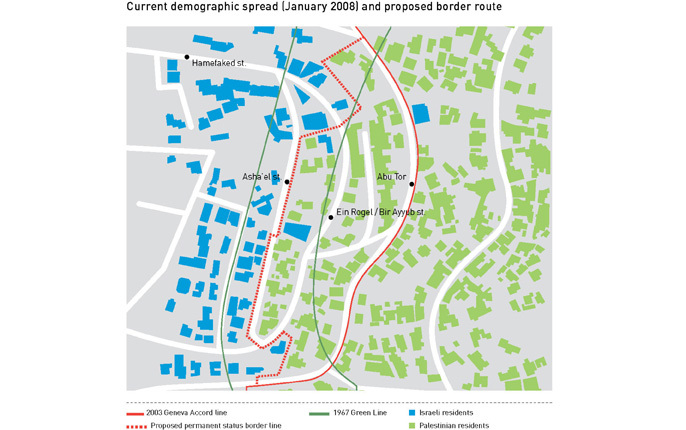 It was launched in 2003 and is frequently referenced today among policy makers worldwide as a feasible framework for a two-state solution. 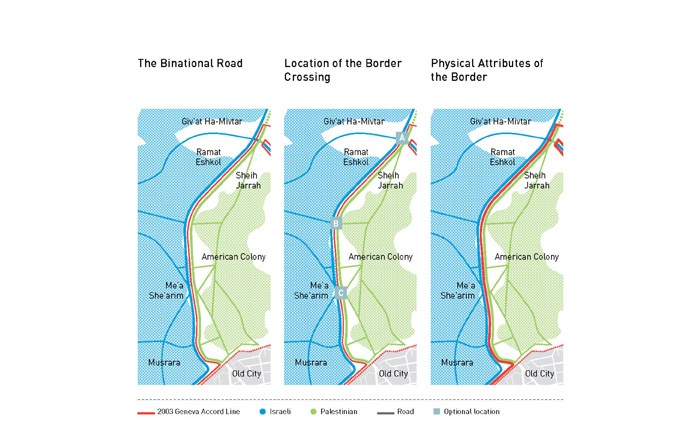 SAYA’s extensive annex to the Geneva Accord focuses on some of the major planning and design challenges that will arise from the delineation of a border through Jerusalem. 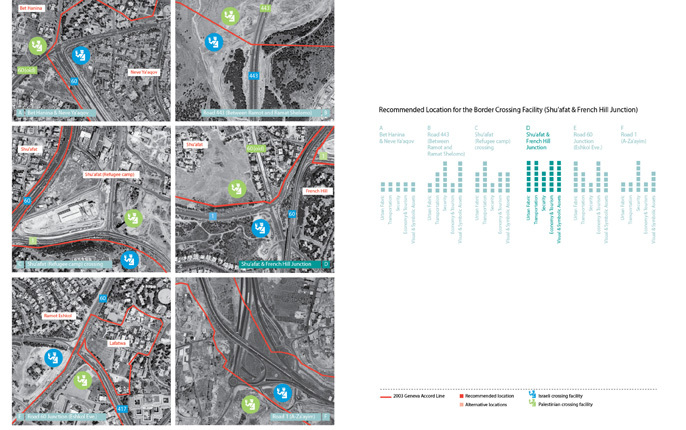 It proposes planning, design, and urban strategy measures to ensure the political resolutions are implemented for the benefit of both sides of the city. 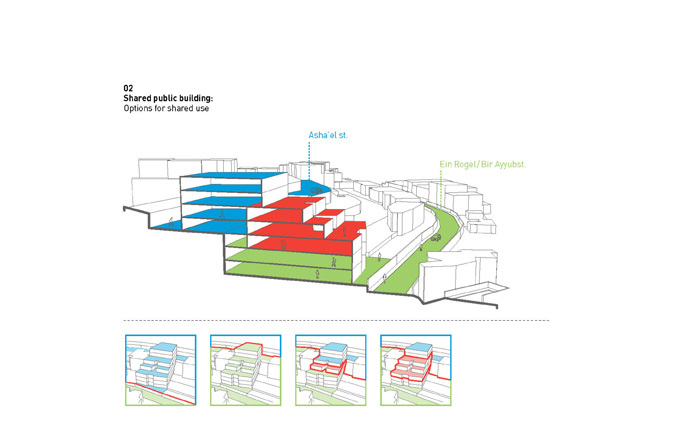 This annex forms a foundation for approaching the division of Jerusalem from the urban and architectural point of view. 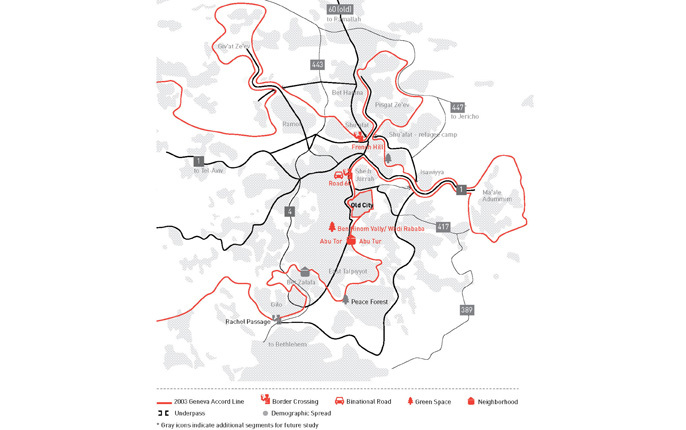 The chapters focus on selected urban sites along the future border. 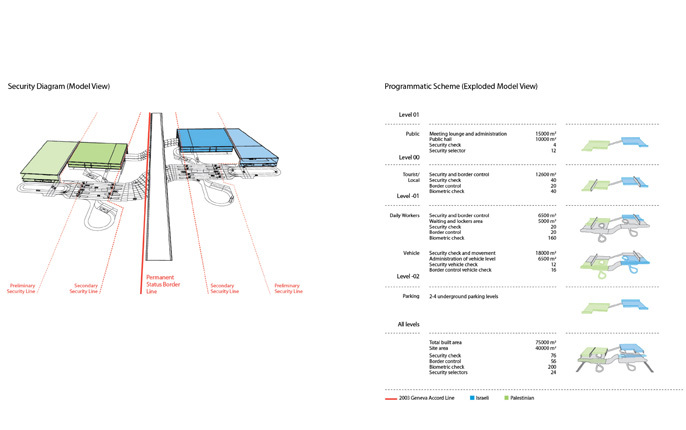 Solutions are proposed for each side- both for a sensitive separation, and for a viable connection between the two sides and peoples. 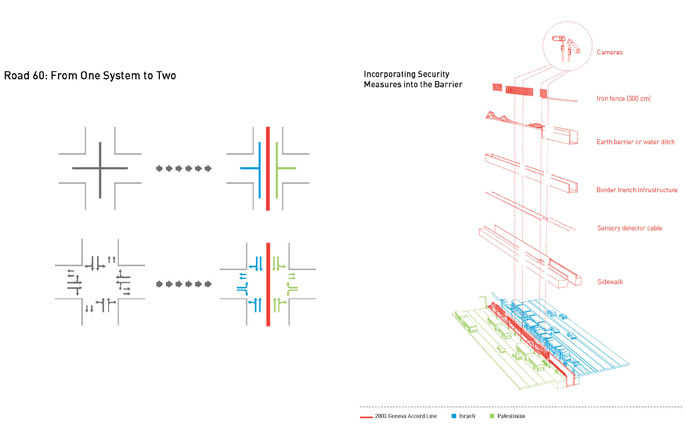 The annex provides a planning guide as well as a solution-bank for the city’s separation. Using it as such will increase the chances of successfully implementing any final status agreement for the benefit of all stakeholders. 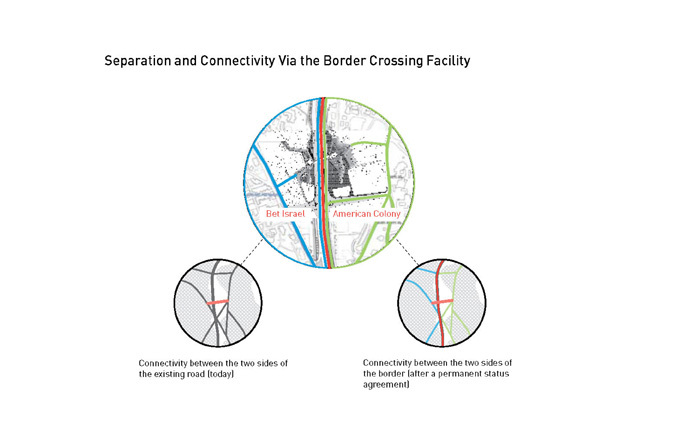 French Hill | A major junction between the two cities Explores a future transportation scheme for the two sides and proposes the location and outline for a large crossing facility in the area. 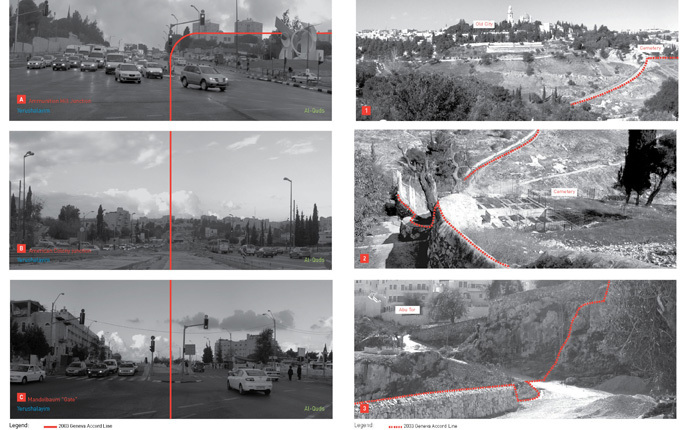 Focuses on critical Israeli and Palestinian mobility and continuity issues in Northern Jerusalem. 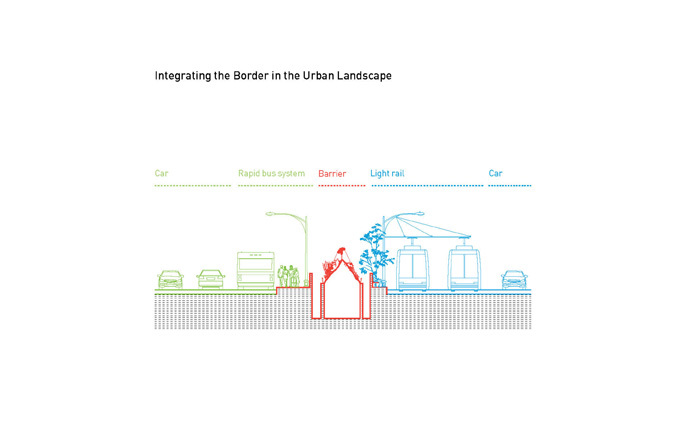 Road 60 | A binational road and backbone for infrastructure Deals with the transformation of a central urban route into a binational road as a border is placed at its center. 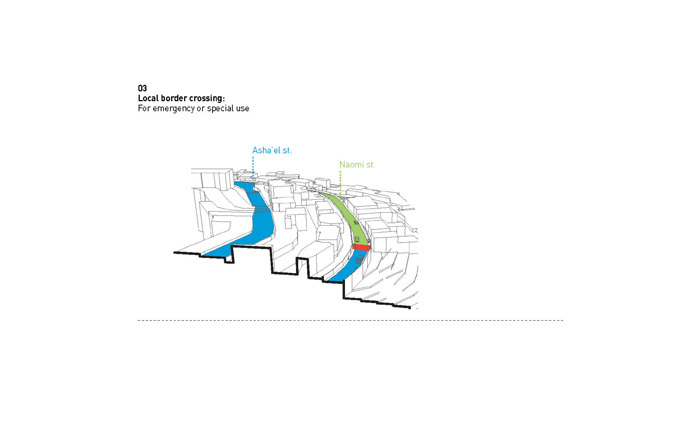 The chapter offers strategies for integrating security and urban transportation infrastructures to accommodate this shift, and also demonstrates a pedestrian border crossing facility linking the two urban environments. 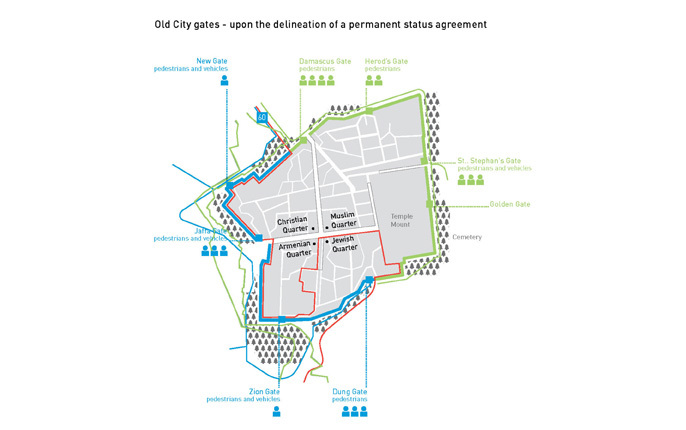 Old City | Special arrangements for entering the Old City Deals with the Old City as an area with special arrangements within the context of a final status agreement. 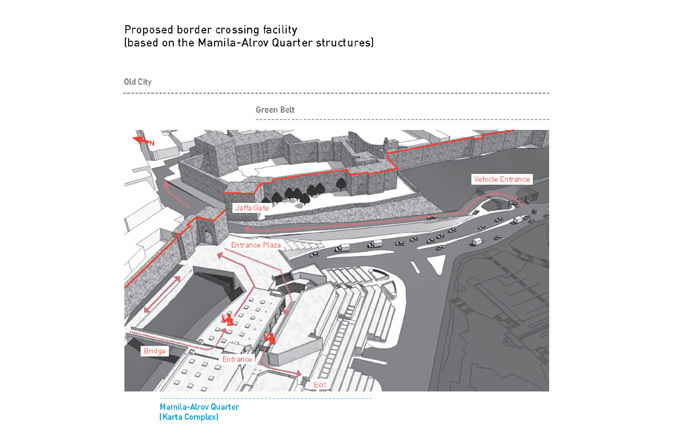 The chapter focuses on a pedestrian and vehicle crossings via the gates, accommodating security apparatuses in this sensitive area and balancing the required adaptation with the architectural preservation of the Historic Basin. 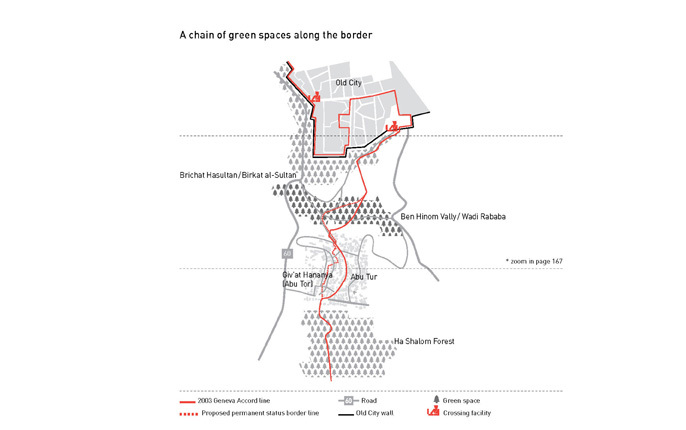 Ben Hinom Valley | A green space and historical landscape Addresses division in an open urban space, and proposes a path for barrier in such areas based on the local topography and existing elements on site. 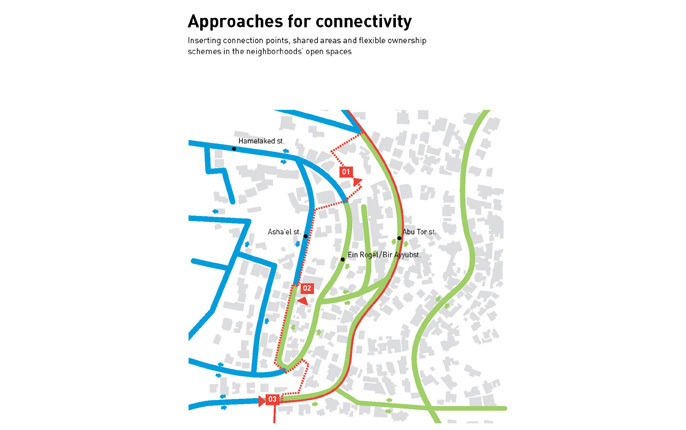 Abu Tor | A mixed, densely built neighborhood Addresses the challenge of separation within a populated mixed neighborhood. 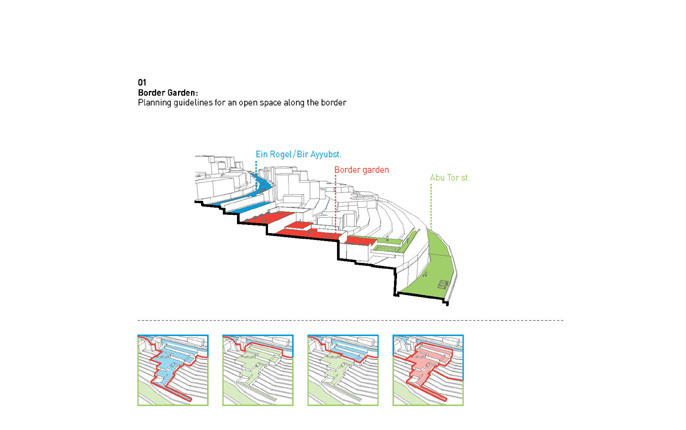 It proposes for a path and a form for a border within the open and built parts of the neighborhood in light of the current local demographic spread, and suggests strategies for implementing separation and connection on the local built typology. 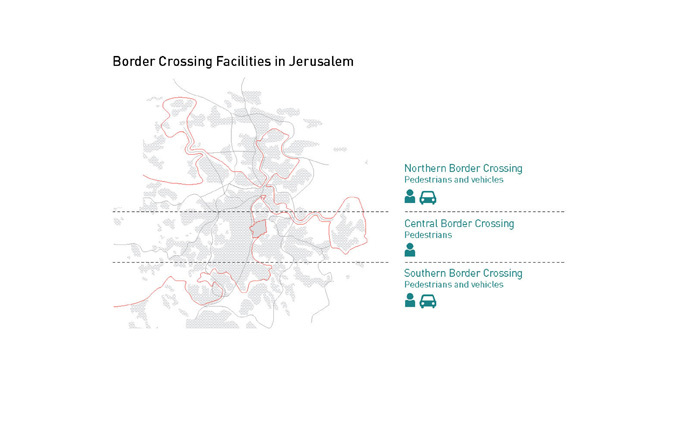 This annex addresses the planning and design challenges that will arise from the delineation of a border through Jerusalem. 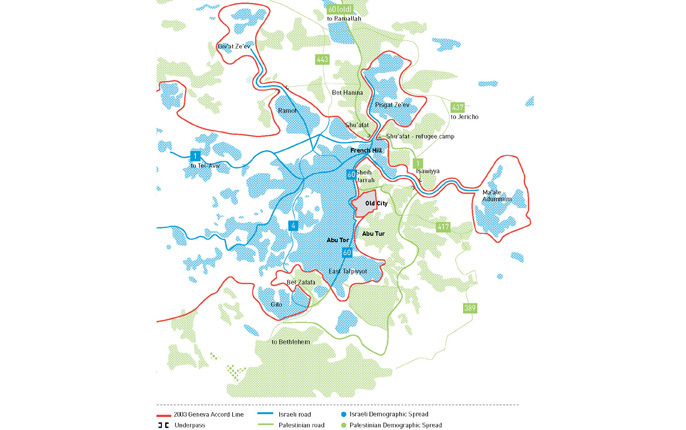 It proposes planning, design, and urban strategy measures to ensure the political resolutions are implemented for the benefit of both sides of the city.